Personal Trainer Of The Month: LeaAnn Scelfo! Having reached the half-century mark, Lea has a world of knowledge to share with her clients. Read about her success stories--including her own. Could you tell us a little about your background - personally & professionally? Since the age of 18 I have always loved training and at one time or another I always belonged to a gym. When I was 40 I met Lou who is now my husband. 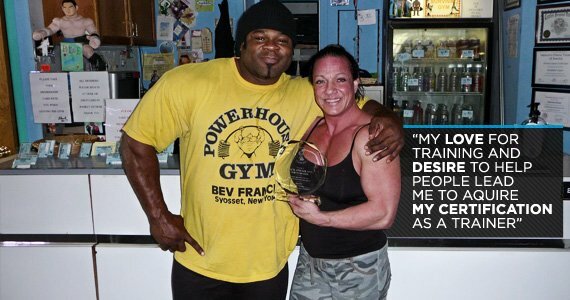 I began training with him and after seeing me train he asked if I ever wanted to compete. I told him it was my "Rocky" dream. He trained me for my first show and I fell more in love with training and wanted to learn more about training and exercise physiology. Lou's knowledge of training and my desire to learn sparked my interest to explore a new career after being feed up with the politics of the corporate "not for profit" world. At the time I was the Director of Intake and Director Of Operations for a 107 bed residential drug treatment center for 5 years. In 2001 I started my personal training business in the evening and after 1 year I was able to leave the corporate world. My personal training business grew to 30 clients quickly. Working day and night I saved up enough money to purchase the gym I was training at. Which is now Lea's Survival Gym, in Seaford, NY. I am now 50-years old, I have been a personal trainer for 10 years and have competed in bodybuilding for 10 years as well. I started competing in 2001 as a lightweight bodybuilder. I later went up to the middleweights and then as a heavyweight I competed in Team Universe. I was the heavyweight winner in 2008 at the Team Universe Championships. In 2010 I competed in the Nationals as a light heavyweight. My personal training clientele consists of teenage athletes, adults, senior citizens and everybody in between, both male and female. I am not only a trainer to those whoare my private clients. As the owner of the gym I do not spend my days just sitting behind the front counter. I am constantly on the gym floor spotting, correcting form, giving suggestions, and talking to my members about diet as well as training. Lea's Survival Gym is a hard-core gym that offers weights, machines and cardio equipment. There is grunting, weight dropping and the occasional outburst of young athletes ranting and raving about a football, or baseball game. When & why did you become a trainer? I started my personal training business in 2002. My love for training and desire to help people lead me to acquire my certification as a trainer. Wanting to help people achieve their goals and watching them succeed is rewarding for the client and myself as well. I was fortunate that the gym I was training at afforded me the ability to train people and build my private business. I also made a lot of money, which helped a great deal. These are not simple questions to answer. I work with each client individually based on their personal needs, life style, medical conditions and personal goals. There is no cookie cutter plan that can be used for everyone. Based on a client assessment at our first meeting which covers a full medical history, and dialogue as to what their goals are and reason for wanting a personal trainer, I begin to formulate a initial plan. If a client comes to me who wants to lose weight I create a plan that focuses on cardiovascular training coupled with light weight training. A diet plan that fits into their lifestyle is also created. If a client wants to compete, depending on the division, Figure, Bodybuilding, Physique Male/Female an individualized program is designed. As a tool I also do initial and monthly body fat counts. The key to my success as a trainer is isolating the clients' metabolism rate. This is easier said than done. You need photographs that span a 5-year period prior to training, that will reveal the individual's weight or weight change. The client will need to give relative information about body weight change from bedtime to wake up. Example: Goes to bed at 190 wakes up at 185, conclusions can be drawn from this in conjunction with feedback from client as well as 5-year history of photographs. After metabolism is established a healthy food plan can be implemented to accelerate or slow down the metabolism. Each client is asked to keep a journal of their eating, training and weekly activities. Not all clients will comply with this so I am constantly modifying my techniques. After this is established based on the clients' goals a training regimen is designed to meet their individual needs. Based on the amount of sessions per week a schedule is created to work the muscle groups effectively. Over the past 9-or -0 years about 65% of my clientele has seen success stories in one way or another. Trish, a 38-year-old woman who's dream was to compete in Figure, placed 2nd in her class after intense training with me for one year. In 2010 she went on to place 4th in the NPC North American Figure Competition. Today Trish is a National Level Figure Competitor who still comes back to me to oversee her last few weeks before her competitions. Norma, a 270-pound 29-year-old female, came to me in 2004. She was sincere and dedicated as to what she wanted to accomplish. At the turn of 2007 she was 151 pounds and went in for plastic surgery to remove inches of skin from various parts of her body. In 2009 we danced at her wedding. This was one of the most rewarding days of my career as a professional trainer. Currently I am working with Larry, a 52-year-old male, preparing him for a Master's division bodybuilding contest for 2012. Through our training sessions his has put on 3 1/2 pounds of muscle over the past 7 1/2 months. To achieve this I have altered his training to power movements and increased his caloric intake. Bernie, who is 38-years old and a doorman at one of New York's finest Hotels, came to me at 320 pounds and asked me to train him and help him get ready to debut the book he is writing called "Revolving Door." Bernie was diligent about his training from March 2010 to May 2011. He went down to an impressive 250 pounds with a lot of muscle. Bernie is a large-boned man with 18-inch calves and 26-inch quads. He fell off his training when the summer of 2011 came around. He will start training at the end of October 2011. Our goal is to have him ready for the debut of his book, in the Spring of 2012. Bernadette, who is now 51, began training with me in 2003-2004. She made great strides working me and became interested in becoming a personal trainer. She studied and took her test and now has had her own business as a personal trainer since 2005. She trains clients at Lea's Survival and has begun to branch off to other gyms. All of my clients are notable to me. However there are a few names that cannot go without acknowledgement that I have consulted with and who have consulted with myself and Lou over the years. Kai Greene IFBB Pro, Fakhri Mubarak IFBB Pro & Professional Trainer, Oscar Arden, Professional Trainer, Douglas Kalman PhD, Nutrition Researcher & Sports Nutrition Expert and probably one of the best nutritionist in the country and Michelle Brent Top Ranked National Level Competitor. All have been a steady force in my career as a trainer and competitor. Can you please give me an example diet and training program you put together for your clients? This is designed for a junior in high school to build a foundation of strength and muscle to assist him on his high school baseball team. Drink at least 8-10 glasses of water per day. This is to keep organs healthy with the increase of proteins. What are the most common mistakes you believe a client makes? Over the years I found that most clients think because they are training and doing cardio it gives them a free pass to eat what ever they want. What I find most female clients misunderstand and have the misconception of is; what is toning the body. Their first statement is "I don't want to get muscles." What I explain to women who are overweight is that we what need to do is to lose body fat and gain a little muscle. This is accomplishes 2 things. Muscle will help burn fat and give shape to the body. I feel the biggest mistake a trainer can make is believing that the same approach can be used on all their clients. I also feel it is important to keep one's mind open to learning new ideas and to continuously educate themselves. Becoming stale and stuck in a rut to one's approach can be a big mistake for trainers. I keep open dialogue with my clients about their goals. Also use their journals to show them their progress as well as before and during pictures if they are willing to take them. Keeping a session lively and verbal by means of pushing a client during a session is important. You also need to know what kind of verbal pushing a client is open to. As I said earlier, each client is trained based on their goals and background. All my clients are pushed based on their own capacity when it comes to lifting and cardio. It does not matter if they are male or female. Some exercise may vary based on the gender of the client. My approach has basically been the same since I started. I have incorporated new exercises, as well as new approaches to form and style over the years. I am constantly learning from those that I value as experts in the field, my husband Lou, Oscar Arden, and from research that I do. Yes, I do an initial assessment to develop a client's beginning point. After 6 weeks I assess the client's progress and develop a new program that will entail a change in exercises, cardio and meal plan. Do you prefer to train a male or female clients and why? I don't prefer one over the other. I like to challenge my clients to meet and go beyond their goals. I want my clients to be excited about training seeing themselves change. Do you feel just like a psychologist as you do a personal trainer? Funny you ask that question. When you work closely with a client such as being a personal trainer I feel the client tends to open up to you. Fortunately for my clients I am a Mental Health Therapist so I tell them they get 2 for the price of 1. They get a personal trainer as well as a therapist. My background as a therapist has afforded me the experience of working with clients that have had eating disorders, substance and alcohol abuse, personality and anxiety disorders. This background coupled with my personal training experience has helped me to motivate my clients, help them get through sticking points, and resolve personal issues in their life. It has especially helped me to get clients to recognize eating disorders that have affected their lives. Being a personal trainer has been rewarding for me. Watching clients make changes physically and personally and being able to help my customers on a daily basis is most beneficial to me financially and is emotional rewarding. I want to thank Jeremy Vargas for nominating me. He has been a dear friend and has always been there to support me over the years.